The Outdoor Sealed System COD SS3 is a condensing, floor-standing, System oil boiler that offers a wide range of different options and features to make it a highly reliable boiler. Designed and manufactured by Mistral, the COD SS3 is a highly efficient unit that can help to reduce your energy bills, as shown by the 92% efficiency, making it A-rated. 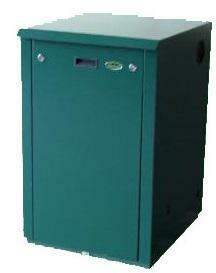 The output rating of 35kW makes this a great unit for homes with 2 or more bathrooms. As an outdoor boiler, it needs to be resilient to many different weathers, which is why it has been fitted with a weather resistant casing that’s zinc phosphated for optimum protection from corrosion. A frost stat is fitted as standard, which helps to keep the boiler running throughout the winter months. It also comes with a polyester coat of durable green texture to give the boiler a nice finish and allow it to blend in with the surroundings. The Mistral Sealed System comes supplied with all components required for direct coupling to a pre-installed water heating sealed system. This unit also features a circulating pump, 12 litre expansion vessel, safety valve, a pressure gauge, lockable cabinet door, automatic air vent, multi-directional flue and a pre-punched pipe entry point on the back and both sides of the unit, allowing for a quick and easy installation that will save you money. In addition, servicing can be completed without the need to access the residential area of the property, there’s no indoor oil line, tandem operation and thanks to its size (480mm wide) won’t take up too much space. Available with a standard 2 year warranty on parts and 5 years on the heat exchanger, as well as being backed by the Mistral guarantee of quality, you can trust that you’ve purchased a reliable boiler.